Fennel sausage, paired with a sweet tomato marinara with fresh basil, oregano, and garlic, topped with fresh mozzarella cheese on a mini Naan flatbread. Kabobs’ Fennel Sausage Naan Pizzas provide an impressive presentation resembling that of a hand-crafted artisan-style pizza. Crafted with a locally procured fennel sausage, and a house recipe sweet tomato marinara. Our chefs hand assemble these flavorful Italian inspired bites, topped with fresh mozzarella. 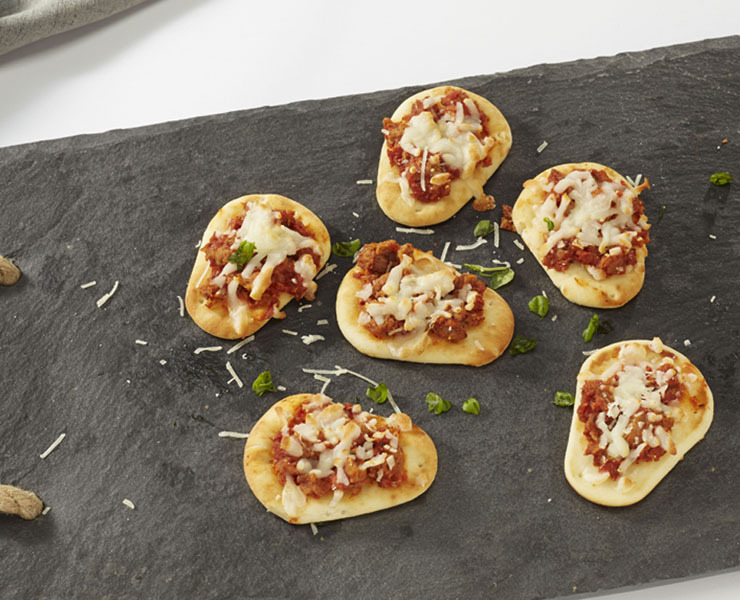 With an equally impressive and robust flavor profile, these mini novelty type pizzas are certain to capture your dining guests. From Frozen bake in a Pre-Heated 350 ºF Convection Oven for 3 - 4 minutes or Until Done. Arepa flour, paired with Mozzarella cheese, formed into a 5” diameter medallion.